Stems: Erect, bushy-branched, angled, glabrous or sparingly hairy; branches longitudinally grooved. Leaves: Alternate, short-stalked, even-bipinnately compound, 2 to 4 inches long; 6-16 pairs of segments, each with 15-30 pairs of leaflets; leaflets linear-lanceolate, less than 1/5 inch long. Inflorescences: Heads, dense, spherical, less than 1/2 inch in diameter, terminal, on stalks 1 to 2 inches long in leaf axils. 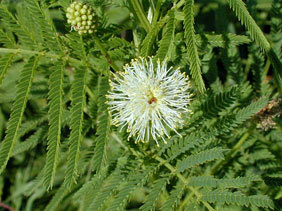 Flowers: Small, white to greenish white; sepals 5; petals 5; stamens 5, filaments long, erect. Fruits: Pods, sickle-shaped, 1/2 to 1 inch long, flat, many in dense clusters, dark brown when mature; seeds 2-5, about 1/6 inch long, brown. Habitat: Rocky prairies, waste areas, open wooded slopes, stream banks, ditches, and roadsides, most abundant in clay or sandy soils. Forage Value: Illinois bundle-flower is high in protein. It is eaten readily by livestock and is considered an important indicator of range condition. Uses: Native American children sometimes used the clusters of dried fruits as rattles. Comments: The common name "bundle-flower" derives from the densely flowering, puffball-like heads. It is winter hardy and drought resistant. The leaflets are touch-sensitive, folding together when handled.